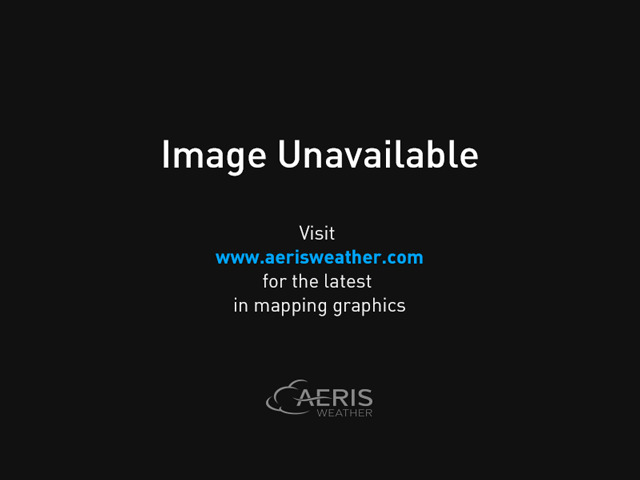 Small and weak Tropical Depression Nine dissipated over Mexico's Yucatan Peninsula Wednesday night, shortly after making landfall near 8 pm EDT Wednesday October 22, 2014 on the western shore of the peninsula. 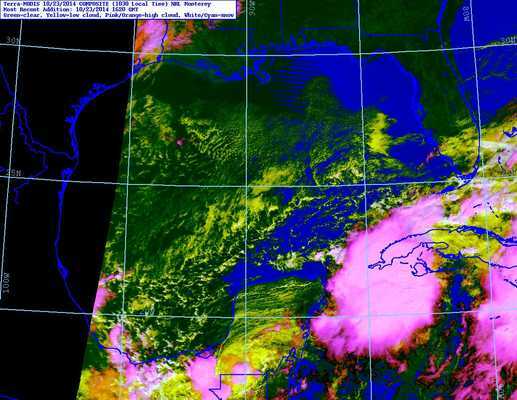 Mexican radar out of Sabancuy and satellite loops show that ex-TD 9 is bringing some heavy rains to the Yucatan Peninsula, Belize, Guatemala, and the adjacent waters, and this activity will continue into the weekend. By Saturday, some of the spin associated with TD 9 may emerge over the Western Caribbean, and we should carefully watch this area on Sunday and Monday for tropical cyclone development--though none of our reliable models were predicting development in their Thursday morning runs. A trough of low pressure connected to the large Nor'easter affecting the Northeast U.S. will inject a large amount of dry air into the Western Caribbean this weekend, discouraging development, and wind shear is expected to be a rather high 15 - 25 knots, which should keep any development slow. If development does occur, Honduras, Belize, and Mexico's Yucatan Peninsula would be most at risk of receiving impacts from the storm. Figure 1. 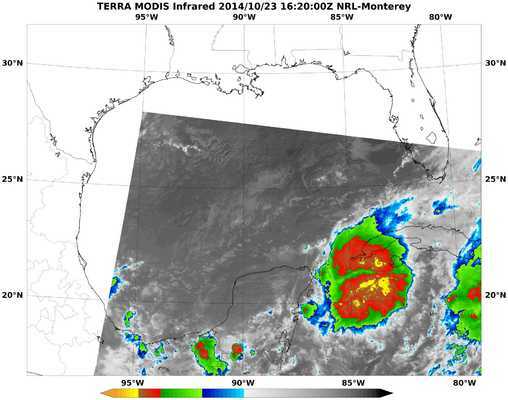 MODIS satellite image of TD 9 in the Gulf of Mexico on Wednesday afternoon, October 22, 2014. Image credit: NASA. An area of disturbed weather in the Eastern Pacific a few hundred miles south of the Mexico/Guatemala border may end up impacting whether or not a tropical depression can form in the Western Caribbean from ex-TD 9. The Eastern Pacific disturbance is close enough to the Western Caribbean to compete for energy and moisture, and upper-level outflow from the Eastern Pacific storm could bring high wind shear over the Western Caribbean. 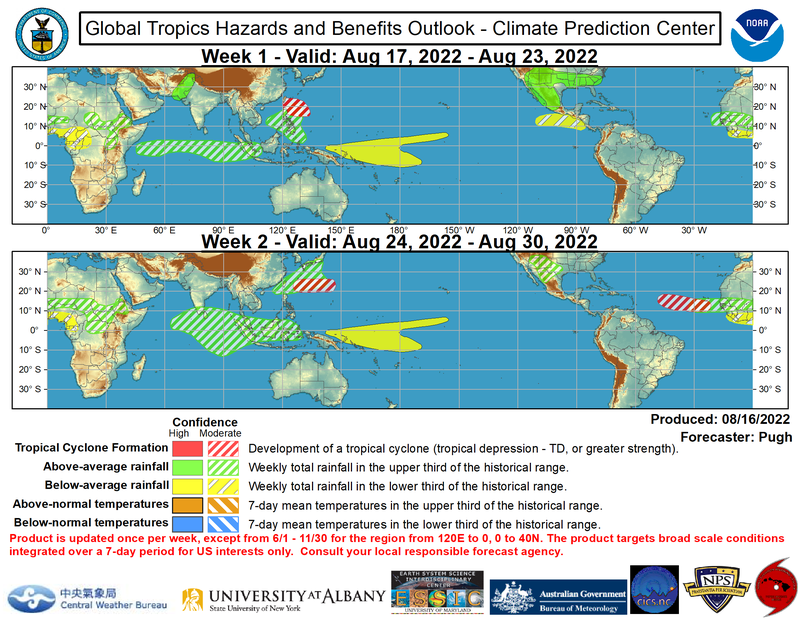 Our top three models for predicting tropical cyclone genesis all develop the Eastern Pacific disturbance by early next week, and in their 8 am EDT Thursday Tropical Weather Outlook, NHC gave the disturbance 2-day and 5-day odds of development of 0% and 50%, respectively. The storm will move slowly northwards, and will likely bring heavy rains to the coast of Mexico and Guatemala this weekend. In the Arabian Sea between India and Africa, an area of disturbed weather (Invest 90A) has formed, and our top models for predicting tropical cyclone genesis, the GFS and European models, have been consistently predicting in recent runs that this disturbance will develop into a significant tropical cyclone by early next week. The Joint Typhoon Warning Center gives the disturbance a low chance of developing by Friday, but notes conditions are favorable for development, with moderate wind shear of 10 - 20 knots, excellent upper-level outflow, and very warm ocean temperatures of 28 - 29°C (82 - 84°F.) The storm will head slowly northwards over the next week, and is not a threat to make landfall for at least five days. Figure 2. MODIS satellite image of Invest 90A in the Arabian Sea on Thursday morning, October 23, 2014. Image credit: NASA. Thank you Dr.Masters! Welcome back Ike! Disastrous: Left Behind - Coming to a Location Near You! We’ll soon begin the touring phase of our photo documentary project, “Disastrous: Left Behind.” This collection of photographs illustrates the failures of non-inclusive emergency planning, and the often devastating aftermath for our community. Our goal is to take the exhibit on a nationwide tour of city and town halls, public libraries, medical/hospital complexes, and other appropriate public art/display spaces. Follow the exhibit page on Facebook for announcements about the launch event, and for new venues as we add them to the tour schedule. Please “Share” with your friends and family, too! We are excited to announce that Portlight Strategies will host a Getting It Right Conference in the Hampton Roads area of Virginia. We will announce the dates of the conference soon! Expect late winter of 2015. In August, we launched a fundraising effort for a good friend of the weather community, Bob Brookens, aka Barometer Bob. Over the last year or so, Bob has been diagnosed with several autoimmune disorders, and their rapid progression left him in need of a power wheelchair and vehicle lift for better mobility outside his home. We’re happy to report that over the last several weeks, we were able to raise the necessary funds to purchase a gently used chair and lift for Bob, from someone in the same area where he lives. Bob’s family will be picking up this equipment for him in the next week or so, and helping to install the lift. As always, we thank you for your continued support of our work!! Convection is actually increasing on ex TD9. When it gets offshore it's going to explode ! no just took a break from work and all I see is just ridiculing especially from you....its childish.. I never even see you post anything weather related..heck I wouldn't even mind you posting pictures from a golf course in "Florida" from your area but you don't even do that..you just constantly either going at Scott or WKC..what has these particular posters wrong you on as you can't seem to let it go? just give it a rest please.. I don't know about that but we should keep an eye on it just in case it decides to do something. Conditions do not appear as favorable as some of the models were suggesting yesterday. Silly question - does some of the missing satellite data not making to the US models also not making into the international globals? Is the whole world of global medium range forecasting going to heck in a handbasket? 00Z NCEP MODELS ARE ON SCHEDULE..
70414/SYA - 10145; UNFAVORABLE WEATHER CONDITIONS..
72712/CAR - NOT AVAILABLE FOR THE NAM; IN FOR THE GFS..
72363/AMA - NOT AVAILABLE FOR THE NAM AND GFS..
DEGRADATION OF THE MODELS INCREASES WITH AN EXTENDED OUTAGE.. Thanks Doc..I say T.D.9 refires in the Western Caribbean, if not, as long as its cooked all the way , I,m not worried. SST's are plenty warm enough to develop a strong hurricane. But look at the wind shear just to the north (it's going to rise) and look at post #6 showing the dry air plowing southward. Maybe by Sunday/Monday timeframe we'll see conditions improve a bit. 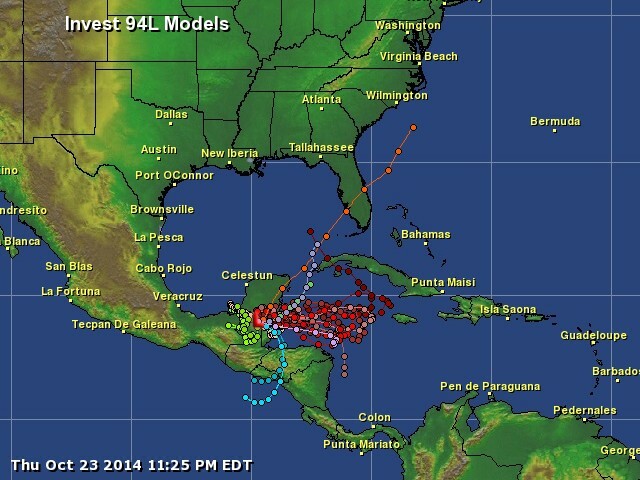 The models are not at all excited about the NW Caribbean anymore. The well marked low pressure area over southeast and adjoining east central Arabian sea persists. The system would concentrate into a depression during next 24 hours. It is likely to move initially in a northwest direction and subsequently may intensify into a cyclonic storm. Currently the convection is yet to be organized. However, the convective clusters have developed during past 24 hrs and their depth has increased. The convection is sheared to the southwest of the system center. Available buoy data suggests the central pressure to be about 1008 hPa and maximum sustained wind speed to be about 15-20 knots. The sea surface temperature around the region of well marked low pressure area is warm (28-30C). The ocean thermal energy is about 60-80 kj/cm2. The vertical wind shear is about 10-20 knots (moderate. However, there is favorable poleward outflow in association with the anti-cyclonic circulation lying to the northeast of the system center. The upper tropospheric ridge at 500 hPa level runs along 18.0N and at 200 hPa level runs along 120n. Most of the numerical weather prediction models are suggesting gradual intensification of the well marked low pressure area into depression during next 24-48 hrs and subsequently into a cyclonic storm. Dynamical statistical models also suggest the gradual intensification of the system into a cyclonic storm. The MJO index now lies in phase 1 and would move into phase 2 with amplitude > 1 during next 48 hrs. This will be favorable for both genesis and intensification of the system over the Arabian Sea by amplifying the convection. Models are saying the mid Atlantic/New England will deal with another nor'easter by Halloween. Near Socotra Island (Yemen) in 72 hours. Thanks Doc! It appears FL is safe once again from a Cat 1 or 2 barreling down on it. Strike up another X for the GFS some where posting yesterday as the 'end of the long streak to a FL hurricane landfall'. So much crow to be handed out today! On a side note, the weekend is almost here and the beautiful weather continues for at least the next week. The top is off my jeep which makes for a cool morning but by afternoon its perfect. Enjoy the day. Word of the day is DRY. Thats what most of us in the SE will have the next week, except for those in the Keys. Ana is supposed to be headed to the Pacific NW. ^ Most humble post of the year. Congrats. I still think this could regenerate in the western Caribbean. We will see what happens. Dry and perhaps a little above average temperatures. Cant complain, winter can wait. Moisture path that Ana should follow....Right into the N.W.U.S. Not bad for a weak system that has been over land for 12 hours plus. I'm not 100% sure Post -TD9 will get into the Caribbean..
Too early to tell though. It just seems to be moving to the southeast which could take it a little too far south. Sorry, I am not taking my eyes off the area just yet. With many of the systems down, I don't exactly have that much faith in their accuracy of nothing developing. The dry air coming down definitely would have a negative impact, but there is still plenty of energy and moisture in the NW Caribbean. Yep..I was wondering if the Antilles blob will join the N.W. Caribbean blob...This would increase chances of a system forming. SKIES WERE CLOUDY LAST NIGHT. 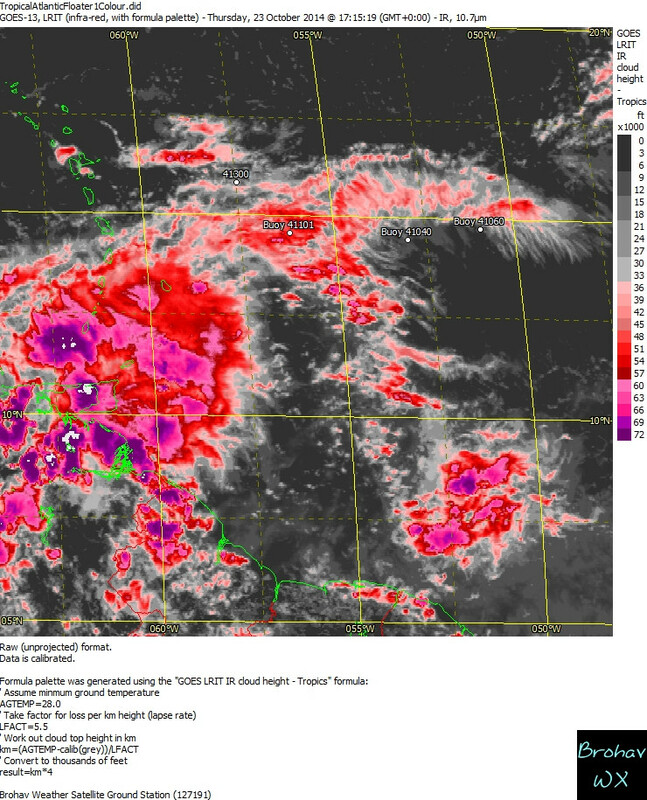 RADAR IMAGES SHOWED RAIN SHOWERS AND THUNDERSTORMS MOSTLY OVER THE NORTHERN DISTRICTS AT FIRST, THEN OVR THE MAYA MOUNTAINS AND PARTS OF THE TOLEDO DISTRICT. 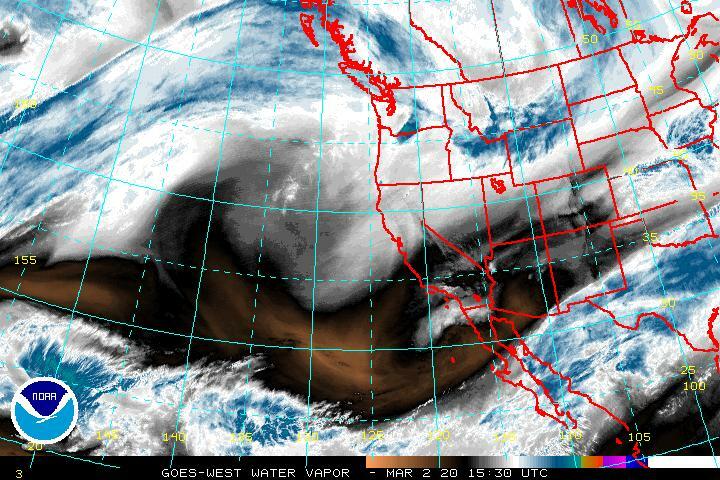 WATER VAPOR LOOP SHOWS VERY MOIST CONDITIONS ALOFT . AT UPPER-LEVELS, A RIDGE OVER SOUTHERN MEXICO AND NORTHERN, CENTRAL AMERICA , SUPPORTS A NW'LY FLOW AT 200MB AND A SE'LY FLOW AT 300MB. CONDITIONS ARE UNSTABLE. AT 700MB, CONDITIONS ARE VERY MOIST, ESPECIALLY OVER THE NORTH AND THE FLOW IS SW'LY. AT 850MB, A MOIST SOUTHWESTERLY FLOW EXIST. AT THE SURFACE, THE 06Z ANALYSIS(NHC) SHOWED A 1004MB LOW OVER YUCATAN. A SLACK PRESSURE GRADIENT SUPPORTED LIGHT AND VARIABLE WINDS, WHILE A TROPICAL WAVE WAS PLACED NEAR 60W. THE 12Z SOUNDING DATA IS UNAVAILABLE. THE RIDGE ALOFT WILL SUPPORT A S'LY FLOW AT 200MB AND 300MB. THE PATTERN WILL REMAIN RELATIVELY UNSTABLE. AT 700MB, MOISTURE WILL REMAIN VERY HIGH, WHILE THE FLOW BACKS UP TO THE SOUTH. AT 850MB, MOISTURE LEVELS WILL REMAIN RELATIVELY HIGH AROUND THE COUNTRY, WHILE THE FLOW VEERS TO THE SE. AT THE SURFACE, A LIGHT SOUTH/SOUTHWEST'ERLY FLOW WILL DEVELOP. GFS RAINFALL MODEL SHOWS .01IN-.25IN/3HRS. NAM SHOWS SIMILAR AMOUNTS. THE RIDGE ALOFT WILL SUPPORT A NE'LY FLOW AT 200MB AND A NW'LY FLOW AT 300MB, WHILE THE PATTERN REMAINS UNSTABLE. AT 700MB, MOISTURE LEVELS WILL REMAIN VERY HIGH, WHILE THE FLOW BACKS UP TO THE EAST. AT 850MB, MOISTURE LEVELS REMAIN HIGH, WHILE THE FLOW BACKS UP TO THE NORTHEAST. AT THE SURFACE, MOIST CONDITIONS PERSIST. GFS SHOWS .0IN-.25IN/3HRS. NAM SHOWS UP TO 1.0IN/3HRS. FORECAST: MOSTLY CLOUDY WITH GENERALLY ISOLATED SHOWERS AND THUNDERSTORMS THIS MORNING. SHOWERS, PERIODS OF RAIN AND THUNDERSTORMS WILL INCREASE OVER INLAND AND NORTHEN AREAS THIS AFTERNOON, THEN OVER MOST AREAS TONIGHT. OUTLOOK: FOR FRI AND FRI NIGHT: CLOUDY SKIES WITH SOME SHOWERS, PERIODS OF RAIN AND A FEW THUNDERSTORMS OVER MOST AREAS. MARINE: WINDS: W/SW 5-10KT SEAS: SLIGHT TO LIGHT CHOP. WAVES:1-3 FT. ; GENERALLY ISOLATED SHOWERS AND THUNDERSTROMS THIS MORNING, INCREASING OVER THE NORTH THIS AFTERNOON. Wow! The 12zNam really moves the low (ex-09) south. Seems to take it away from the ill-effects of the dry air/wind sheer of the approaching front, allowing it to regenerate. I wonder if its still moving at just 5mph? That was its movement the last time I checked when the system was a T.D. 12 hours x 5 mph =60 miles traveled? Post TD9 is doing a fast walk across the Yucatan. 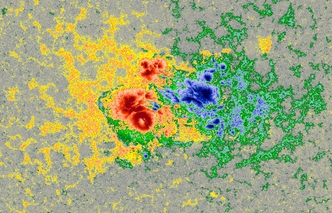 A morning look at sunspot 2192, which has grown even bigger in the past 12-18 hours. 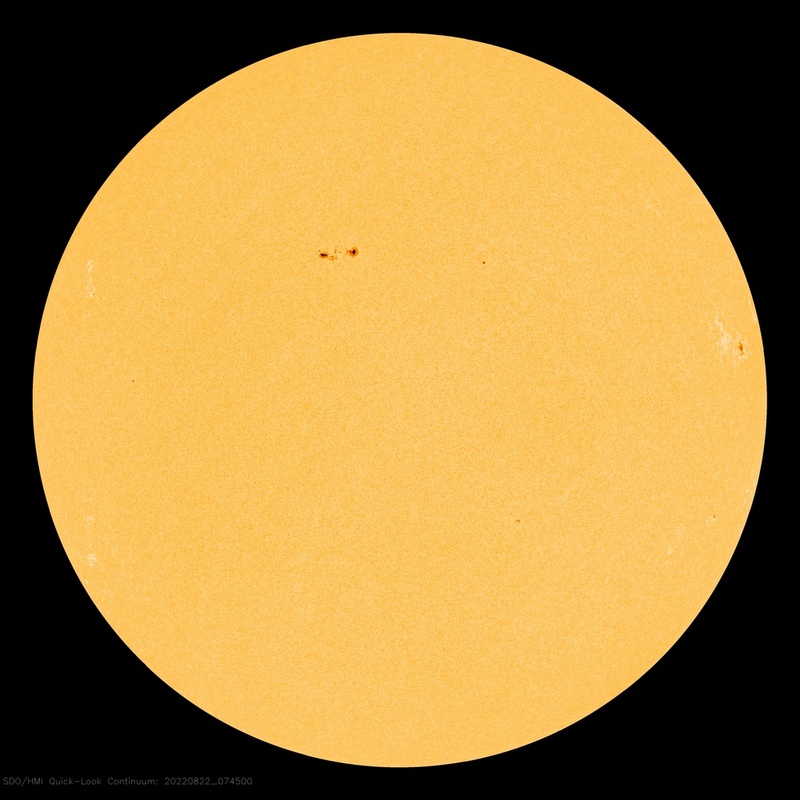 Solarham.net mentioned this morning that in terms of size it is now on par with legendary sunspot 486 from the previous solar cycle, responsible for the largest solar flare ever measured and the extreme solar activity and aurora displays that occurred in late October, 2003. Given it's enormous size and magnetic complexity it's a little surprising 2192 has "only" managed to produce a couple low-end X flares, and none of its flares have been producing CMEs. 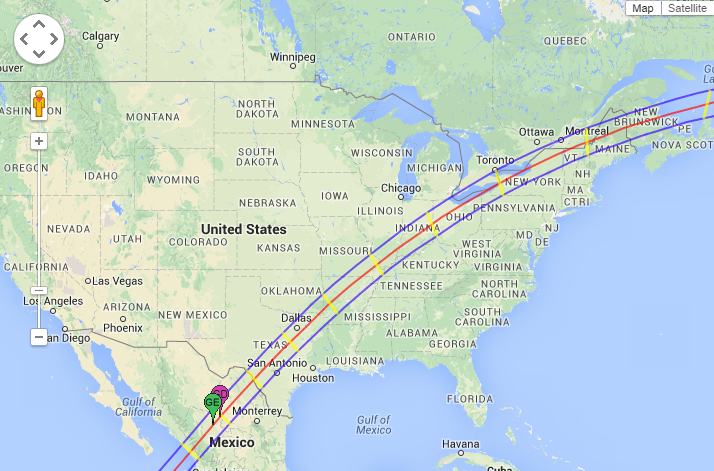 It's in a perfect geoeffective position now though; if something big happens today, we'll be staring right at it. I saw on TV this morning that the sunspot is larger than Jupiter. Amazing! I do not know the forward speed but from the navy satellite imagery it appears to be close to half way across. The latter half of the trek over land will bring some interaction with higher terrain than the flatter part of the Northern Yucatan. This will hurt the low somewhat but should allow for convective blow up due to orographic lift. Overall perhaps these events will balance each other out. I expect to see continued increase in convection today. Keeper and anyone else who cares to answer- I am driving a uhaul from Miami to Anchorage. Any areas I should be aware of regarding nasty weather. I am picking a friend up in Montana, so I am planning on going the central access route.up thru Canada. I know hard to predict what will be there in a week... But sometimes you get an idea of a weather system moving through the area. And, yes always check travel weather before I leave (When possible). I am kinda of limited in Florida though - it is either the turnpike or I-95 and at times they are so close you can see one from the other. Is there any spin to those blobs under Cuba? I mentioned them yesterday because they look like fierce rainstorms at the very least. Thank you very much for the update, doc! The last night in Slovenia brought heavy showers, strong wind, and flooded roads. The quantity of rain that fell in eight hours equals the monthly average for October. This is the catastrophic result of heavy rain around Ljubljana. Moreover up to regionally 150cm (59inches) of snow in Austria. 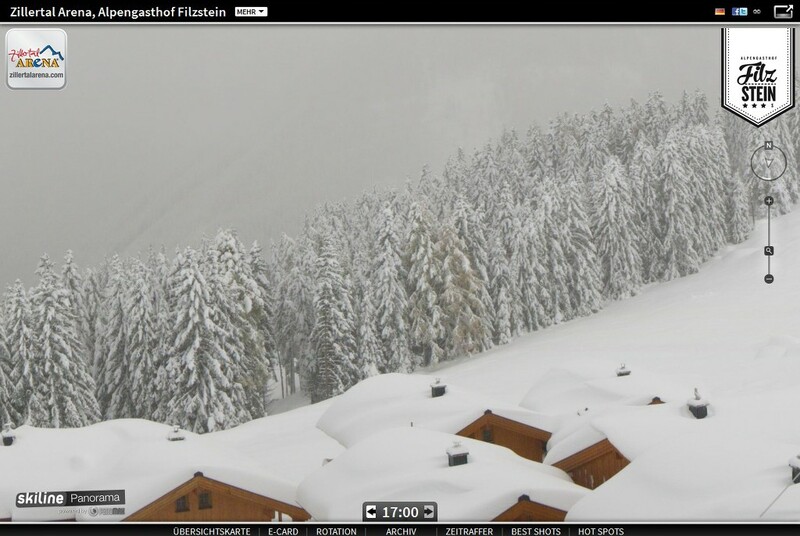 Webcamshot from Zillertal, Austria. Source. Despite the flooding the country side looks beautiful. 850mb vorticity is really strung out from ex TD9 all the way to South Florida. If something were to develop in the NW Caribbean, the vort over the Yucatan needs to separate itself. Thank you for the updated blog entry Dr. Masters..
Dry air entrenched here for the State Fair.. I can't answer your question but that is a crazy drive. Be careful and pay close attention to the local NWS offices. - The Nor'easter churns along the southeast New England coast today and chugs toward the Canadian Maritimes later tonight and Friday. - A soaking rain covers eastern New York and New England with lighter rain and showers in western New York, Pennsylvania and New Jersey today. - Tonight the rain tapers off in all locations except northern New York and northern New England where it remains all night. - Lingering showers continue in northern New York and northern New England Friday. - Northeast winds of 15 to 35 mph with gusts over 45 mph are likely along the northern Massachusetts, New Hampshire and Maine coasts. - Minor coastal flooding and beach erosion are possible due to those strong winds. - Gusty northwest winds are likely from the coasts of Rhode Island and Connecticut south to eastern Virginia. - These winds will be offshore so no beach flooding is expected. - However, some minor over wash from back bays could occur on western shores of any barrier islands. - Conditions improve in all areas Friday as the storm moves away. - High temperatures Thursday will be in the 50s north and upper 50s and 60s south. The weather is already getting bad in the interior areas of Alaska. Be prepared for snow covered roads or snowfall once in northern Canada and Alaska. ESPECIALLY SOUTH OF ALLIGATOR ALLEY. FLOODING ALONG THE ATLANTIC COAST AND ATLANTIC METRO AREAS. GOES Satellites back up and running. And with that the GFS is back onboard with development. Hi nrt. Now that things are back in the sat feeds,will the 12z model package be with all the information or is better to wait for the 00z? Experimental FIM-9 showing a small system. Remember these small systems can ramp up quick or wind down just as quick due to small changes in the environment. This area east Cozumel needs to be watched as there appears to be a circulation developing. By looking at some of the 12Z models they show this area drifting SE before turning back to the NNW. *sighs* This is why I'm done with this blog for a while. GFS in 24 hours shows the system just south of Florida. It could get stronger than the GFS shows, but dry air is going to fight it on the north side. This one can be posted when you copy (and paste) the image-address which shows up when you do a right-click on your mouse (when using firefox). The other one may not be postable at all as a picture, and this applies to html sites too. Dak...I drove to Fairbanks and back many years ago...That is when the last 1500 miles was gravel road (Alcan Highway) . At that time winter was the best time to travel because the gravel would freeze and not break windows and be so dusty.... My ex was stationed at Eielson AFB way back then....We drove up in February and back in December, almost 2 years later...Beautiful country, but dark most of the time in winter. We did this in a 1970 VW bug no less.... It took 11 days, 12 hours a day. but "I was so much older then, I'm younger than that now"
If you go to http://preview.weather.gov/edd/ and click on the travel hazard forecast(Yellow symbol with car skidding) on top right you can enter your starting and ending locations and get a basic forecast. I would check the Model Diagnostic Discussion and see what they say. Most of the data has been back since 23/00Z. 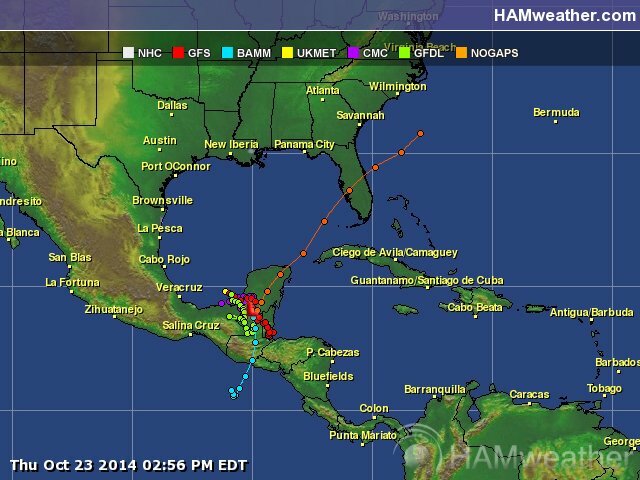 That is about where the low now moving across the Yucatan should finish up if it maintains a SE trajectory. Convection continuing to build over land and vort max expanding. I don't think this is over just yet. Yes, that's the forecast. Mostly frontal related in the eyes of the NHC. Right now the NHC gives it 0% chance of development. Ghcc visible loop of x09L, looks better today than it did yesterday. I think the time has come and gone for anything to develop now. Cold front comes, brings drier air and more wind shear. There would have to be a significant change in upper air pattern and water vapor in the GOM. I mean, anything is possible, but hard to see anything growing big despite the warm SST's. lot of dry air next week in the GOM. They were never down in the first place, NCEP/NESDIS said it was an issue with connection. They've always been working it has just been a network problem stateside that prevented data from getting into models/satellite images. If it does indeed hit as a major hurricane, it'll be the first time since 1999 that India has been hit by two major hurricanes in the same year (and only the second time ever from what I can tell)! Have a nice evening everybody; I'm out for today. And kills it as quickly as it develops it. Need to see if it is more bullish with the next run. keys all reporting ENE winds in the 20 knt range. Near doom. High pressure is trying to build into the area. I'm in Fort Myers and we have a beautiful NE wind around 20 mph and lots of sun. It feels great outside with temperatures only in the low 80s. I'd like to add only 1.24" of rain this month with dry weather in the forecast until late next week. i think the low to watch is the leftovers of the cyclone moving into belize surprised the leftovers are not even a invest. well it looks like this system will not be developing.. too much dry air and the conditions just aren't there to support it's development. the basin appears to now be shutdown. Acording to the weather services in Honduras and Belize, besides de NHC, a Cold Front will be in the NW Caribbean saturday and Sunday. They dont even mention a low pressure or something like that, so i guess nothing will happen there. Agree, and NHC think that too. The front will have to pull away from ex-TD9 in order for it to develop in the Western Carribean as stated by the latest from the NHC. However, I actually believe the satellite presentation looks better today over land than it looked yesterday in the BOC. Sometimes hard to explain why convection fires over land. Unfortunately, Katrina did not fall apart over South Florida either, and if I remember correctly, looked better on satellite crossing over the state than she looked off the east coast. As far as I know they are still testing & calibrating. Hello everybody!! !, just wondering is that huge blob East of the Yucatan Peninsula will move over South Florida?, it looks very strong!!! !, and I can see hints of a twist in the clouds,don't know how far South the front will come? maybe all depends on how south this front become stationary that we get all that bad weather here in south Miami,FLorida. We have near 100% chance of rain today in our area but just clouds not rain so far,but that blob looks impressive!! any thoughts if we here in Miami will be affect it by this system?, thank you!!!. los previsto en nuestro pronostico general. acumulados de 100 a 150 milímetros en las próximas 72 horas. Santa Barbará, Atlántida y el norte de Yoro. cuatro grados Celsius en el territorio nacional. oscilar entre 4 a 6 Pies y en el Pacifico de 3 a 5 pies. it's important to note it only has a 1/10 chance of developing into a tropical system but even if it were to which seems highly unlikely at this time it would probably be weak and last very short time. much less affect florida as a hurricane like some of the models has been predicting..
Nice wave moving through the Windwards. Possible blob alert when I wake up from my nap. it's important to note it only has a 1/10 chance of developing into a tropical system but even if it were to which seems highly unlikely at this time it would probably be weak and last very long. much less affect florida as a hurricane like some of the models has been predicting..
Yeah, but just a little while ago it was a dead system with 0% chance of development. At this time I haven't see any model support to show a system forming in the western Caribbean and moving north and affecting Florida. So the odds are very low. GEM doesn't count. It forms a system that comes from the east towards Florida. First sign of Fall in Florida. i actually went through wilma in 2005 and most storms that form in october usually come from the west.. anything in the record books coming from the east this late in the season? I think Jeff is confused. The GFS model clearly shows TD 9 re-forming over the bahamas on Friday as it moves northeast. The low in the western Caribbean that may show up over the weekend or next week is a totally different low. I saw this on NBCnews this morning. HuvR - Hoverboards - they're crazy and hard to believe. Off topic but very science related. They fooled NBCnews this morning with the story. So I'm guessing the Huvrboard is fake. I just can't figure it out. Depends on your outlook. The board needs a metal floor to work and the battery only lasts 7 minutes. I see it as a model to show how cool it would be if we were really smart and could get magnets to work against concrete, dirt, water and rocks. I saw this on NBCnews this morning. I had never seen it before. Yeah, I edited my post. NBCnews has dropped the story from their sites. On NBCnews they even said you can purchase them for $10K. I'm sure it had a lot of people across the nation fooled when they ran the story. I wish they were real. That would be too cool. Which run of the GFS? It showed it going mostly to central Florida. 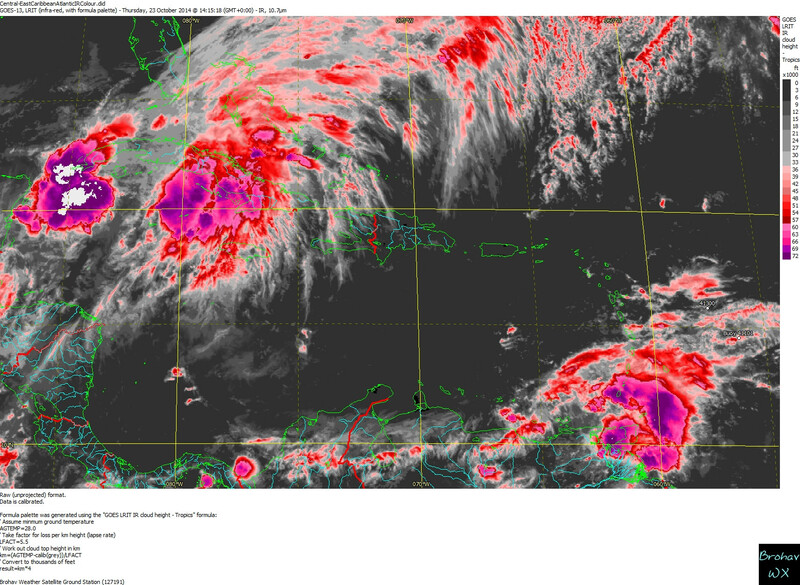 I don't remember anything about it being a remnant reforming over the Bahamas. The non-tropical low currently feeding moisture into south Florida is the one that will be over the Bahamas. Which run f the GFS? It showed it going mostly to central Florida. I don't remember anything about it being a remnant reforming over the Bahamas. The non-tropical low currently feeding moisture into south Florida is the one that will be over the Bahamas. 12Z ECMWF doesn't show anything except the low forming in the EPAC. I think that low is going to steal all the energy from the Caribbean. I'm going 50/50, toss a coin. Waiting to see what emerges over water in roughly 24 hours. Still some significance to being mentioned at all. 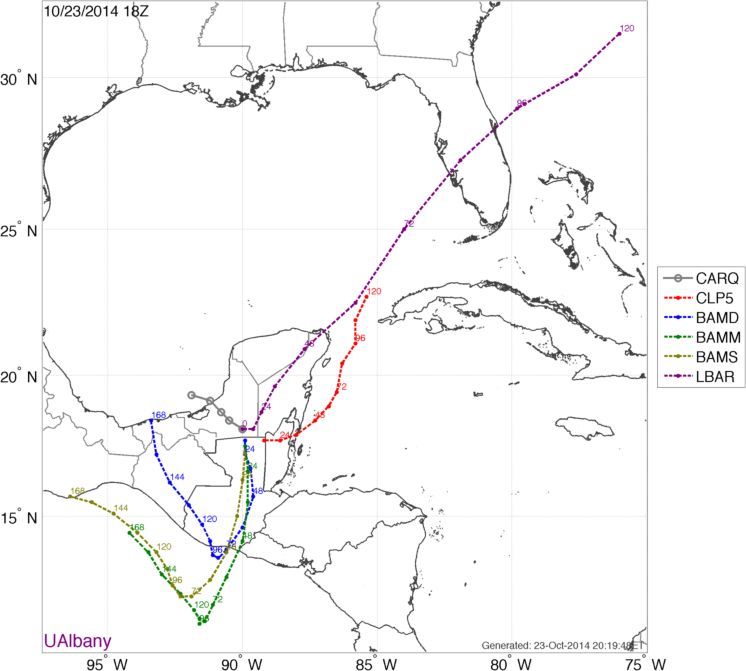 As Gro mentioned earlier, there is much going on in the GOM and NW Caribbean. IMO, still a chance for a quick October spin up. Maybe if someone at NBC had just looked at the site, which hasn't been updated since March, and saw there was zero information about the company, they might have gotten a clue. Journalism is sinking to new lows. Looks more like the dreaded Code Pineapple. I'm a sailor anchored in the Bahamas so I'm paying close attention to this. My favorite site for wind is WWW.MagicSeaWeed.com. They use the latest GFS model to make their charts and the charts definitely show the low moving over Cuba and building when over the Bahamas. That is the low from TD 9....no doubt about it. Ex TD9 now half way across the Yucatan and resurrected by the NHC as 94L. LOL. Pretty much what I expected. No, it was deemed a remnant low, and the NHC always thought it would reemerge into the Caribbean. It was never a "dead" storm, since it was still a low with a COC. The only question, and the one that still remains, is can it reorganize into anything strong enough to become a tropical storm in its own or does it remain a weak low that gets absorbed by the very strong cold front that's going to penetrate all the way down into the northern Caribbean this weekend. I would hope after the fiasco of the original GFS hurricane tracks that we'd wait a bit before hopping back on that train again. Use it for surfing forecasts. Good site. www.swellinfo.com is good too for nearshore winds and waves (less than 20 nm). Looks like its fighting to get a name. We will see if it can strength in the NW Caribbean sea. Post TD9 is moving very slowly and won't make it into the western Caribbean until late Tomorrow or Saturday. Magicseaweed.com has the low just south of Florida in 36 hours on Friday. In 36 hours on Friday, Post TD9 will be just nearing the coast down by Belize. I didn't mean "dead" literally as in totally gone. But as far as the NHC was concerned it had 0% chance of forming back into a tropical cyclone (based on their 5 day cone). What I see between now and Sunday is a low that keeps appearing, disappearing, and jumping around the map. Given that the low isn't even back out over water and the recent performance of the GFS, a few runs after it gets situated is likely to give you better information. That will depend mostly on the upper air dynamics as the SST is plenty warm. If it does spin up it could become very interesting with the TCHP still off the scale. Another alternative would be for it to become absorbed by the front and a new low spins up on the tail end of that. This time of year the NW and SW Caribbean becomes somewhat unpredictable. The models on the fritz still I see.
" I am driving a uhaul from Miami to Anchorage"
I think I'd just buy new stuff when I got to Anchorage. But as far as the NHC was concerned it had 0% chance of forming into a tropical cyclone. A post-tropical remnant low does not have a zero percent chance of reforming into a tropical cyclone. In this case, it had a zero percent chance of becoming one once it went inland. 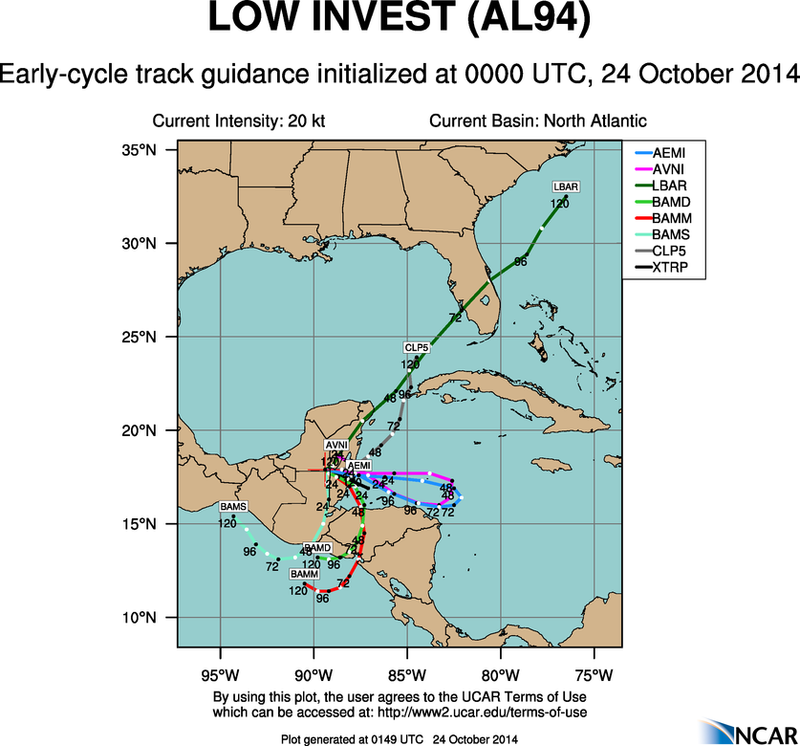 Since the low is still there, it's now an invest as it heads toward the Caribbean. It still has to hold together a circulation until it gets to the coast and at least get back to TD strength again if it has a chance, hence the 10% probability. 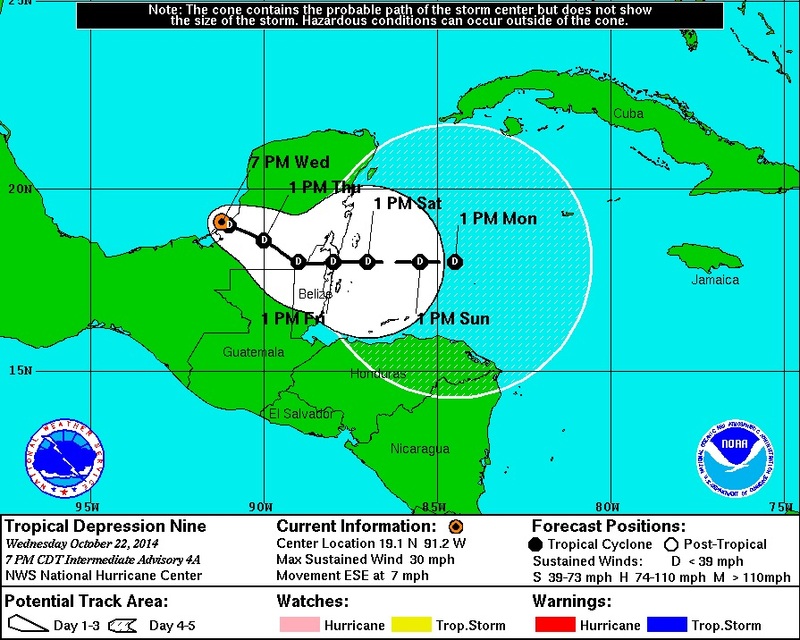 Is post TD9 going to get caught by the front and scooped up or move slowly into the western Caribbean near Belize? I was assuming post TD9 was going to come out into the western Caribbean near Belize late Friday. The Circulation does not look as good as it did a few hours ago. 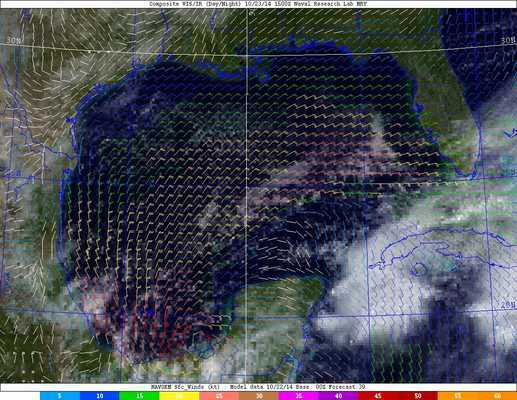 Also notice the low level winds to the NE of 94L (South of Cozumel) are actually out of the west moving away from the circulation center. This is also happening east of the system off the coast of Belize. Then it also has to deal with the upper level outflow from the blob off of western Cuba. 94L has a lot of work to do in the next day or two if it is going to hold together in my opinion. Just yesterday (06z)the GFS had a hurricane going into Florida. Even Dr. Masters posted that it could be a dangerous situation. Big red blooming pretty quickly. 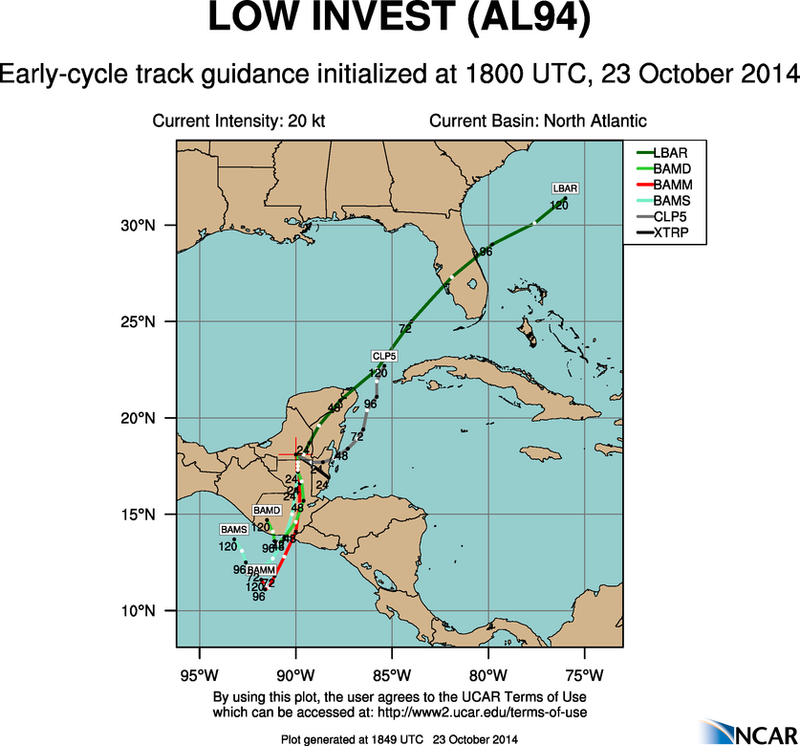 why are calling it invest 94L! Another big blob. TWC was saying these big blobs of convection are due to the jet stream diving down (frontal precipitaton). They are unrelated to post TD9. I was thinking this earlier Kman. 94L might add a bit of energy to the front enabling it to spin up a new low. Looks like a few models on board (post 166) with something hanging in the NW carib 4-5 days out. No kidding. When I moved from CA to FL I sold everything that I couldn't fit in my car. Saved a ton of money and aggravation. It's mostly a huge stream of high and mid level clouds being dragged out of the tropics by the low level tropical jet. The actual trough of low pressure that's currently between Cuba and the Keys doesn't have a lot of dynamics to work with, and the front is going to pus the rain bands even further south. The Keys are the only places it's raining now and even that's going to pushed south for the weekend. The chances are that Miami will get some showers and thunderstorms today, with the chance of some isolated brief heavy rain. By Saturday, it will all be gone, and Miami should be in for a very nice weekend. GFS show's the dry air killing it. Of course. Nor did I say it was. Surely is blooming though. 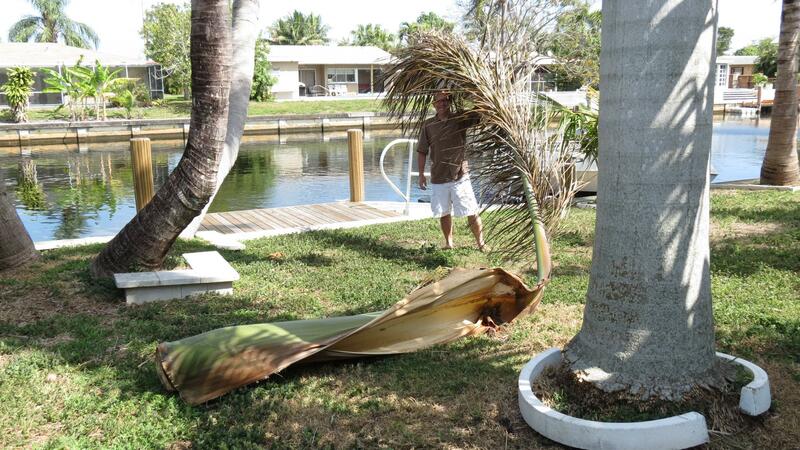 Windy in S Florida today. Actually, if you look close enough, it has that low pressure splitting in two with half going over Cuba and half not really doing anything until Sunday. The half that goes over Cuba will start to build over Bahamas giving me 30 knots of wind to deal with but as it moves farther northeast it dissipates so I guess that is why everybody is ignoring it...except me who has to deal with it tomorrow. Looks like all of the models are showing two Lows. There's also a chance that the front will provide enough push to turn the low more SSE and keep it over land for a longer period. If that happens, the chances increase that the low can turn SW and end up in the Pacific and never get back into the Caribbean. I don't think there's much written in stone yet for 94L. I don't see Post TD9 splitting. What I've been seeing are small lows spinning up and moving along the front to the east. This has been going on for the past two days. That's what contributed to the rain in the Keys the past three days. Check out the NAM at 30 hours. It shows these weaknesses or lows sliding along the front. 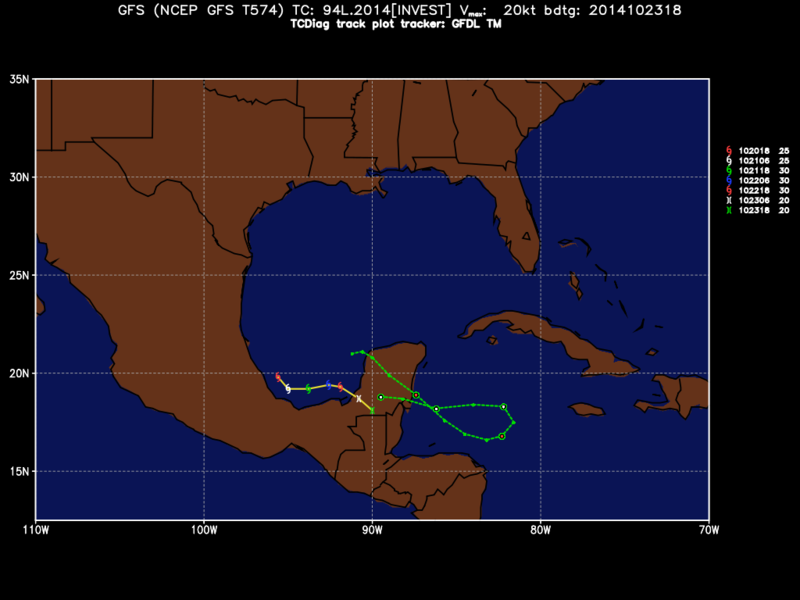 But TD9 has always been down in the southern BOC and then moved into the Yucatan late yesterday. The NWS Marine Forecast for the Bahamas has a pretty good synopsis of the weather for the next several days. The low may form on the stalled cold front over far south Florida tomorrow and then track toward you over the weekend. I don't think this is 94L but a baroclinic low that has been previously forecast. Looks like 15-20 knot winds with 3-5 foot seas. Where are you at? Are you anchored in or out? I spent about 20 years sailing the Caribbean, so I understand being anchored out can get a little uncomfortable, depending on how well you're protected from swells. What are the locals saying? I usually put more stock in that than I did models or forecasts. Dr Masters correctly, IMHO, used words like "may", potentially" and "possibility" and, advised us to keep closely monitoring the situation. I, for one, am doing just that - keeping a very close eye on everything going on in the area - given Caribbean SSTs and the time of year, there are a number of possible outcomes. I hope, whatever the outcome, it is benign. Right at the moment, I welcome the cooler breeze and the odd shower of rain! Ok, I guess comment 186 explains it... So what will happen to that energy as its pushed south? Will it interact with 94L? They said that the sun was going to come out today Lol no sun at all!! Looks like the low has finally made it to the Caribbean. So that's Friday evening. You will need to hear it from the blog's official blobologist Grothar. Low has weakened while now over open water in the sweet spot of the western Caribbean? We need that rain over here in S.W. Florida. We've only had 1.x" of rain this month in Fort Myers. 1008mb low in the western Caribbean. 1003mb leaving the Bahamas. Need to see if this gets support from the GFS or the Euro. 18z NAM at 60hours the low is back up to 1005mb near the coast of Central America. Doesn't look like the low is going to do much of anything. Convection starting to flare up now as the circulation of 94L starts to tap into the warm waters of the Gulf of Honduras and aided by the anticyclone overhead which is allowing inflow to rise and cool. Current surface pressure in Grand Cayman is 1008.3 mb, fairly low for not having an organized system around. Oh, it will interact with 94L, assuming it's there. If it is, the energy may simply be absorbed by the front and increase the amount of rain possible from Central America to the Bahamas. If 94L can develop into something more than a weak TD, it may uses the cold front to catch a ride NE, but the cold front and the dry air may also just kill it. A lot depends on things like the tropical jet, how far south the cold front gets, how much dry air gets injected into the low, if another low can form on the front much later next week...many, many questions with almost no answers right now. Because of this, the chances any models are right more than about 48 hours out are much lower than normal. This is one of those times we just have to wait and see what happens. Going back and looking at the 12z NAM there's really not much change with the 18z NAM. Each run puts a low in the same area. I'm not expecting much from the 18z GFS. It will most likely be similar to the 12z. But who knows. The GFS does some really weird things. 94L looks like its going to be over water faster than it was forecasted. Oh well, at least it's been a bit cooler. Convection starting to flare up now as the circulation of 94L starts to tap into the warm waters of the Gulf of Honduras. Current surface pressure in Grand Cayman is 1008.3 mb, fairly low for not having an organized system around. We can see in the ASCAT the center hooked in south of Cuba. This is certainly more disruptive, 12Z GEOS-5 adjusts with a little more struggling, maybe a STD (sub-tropical depression) by the time it brushes South Florida tomorrow evening. Still has that trough split happening & for 1 1/2 days has put the second low back into Central America. Posting the low as close as it gets to the Caymans..this is Saturday...and it really just keeps raining on this area thru Monday or longer. SUNSET SOLAR ECLIPSE--TODAY! On Thursday, Oct. 23rd, the Moon will pass in front of the sun, off center, producing a partial solar eclipse visible from almost all of North America. 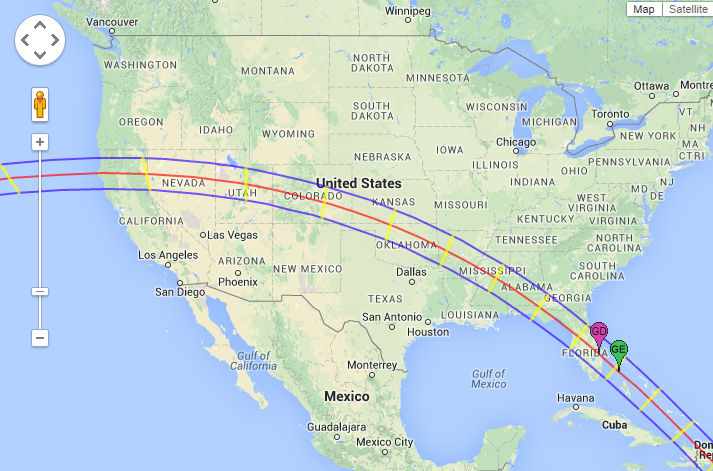 The event will be particularly beautiful in the Central and Eastern time zones where maximum eclipse occurs at sunset. Science@NASA has the full story. It is a non-tropical low that should be moving east and as of now, not amounting to much. It just looks like a blob. That would help, I agree. Yep..I believe this will surprise a few forecasters, even with the dry air. With the low shear explained here in this picture. Ok, cool! So what are you doing here? Fun weather today here in Longview, WA - had a funnel cloud about 1.5 hours ago that tore down power lines and tore off several roofs. No reported injuries. Rain for extreme south Florida tomorrow. The rest of the state is going to be dry for at least the next 7 days with high pressure and dry air establishing itself over the state. So if something were to come back up towards Florida it wouldn't be until late next week. Chances are looking extremely low for any tropical development moving north back towards the U.S.
Good reason to get outside and enjoy the weekend. Reading Doc's entry, people's posts and looking at their satellite/radar images. You? Nothing murky about that , Grothar. Thank you. 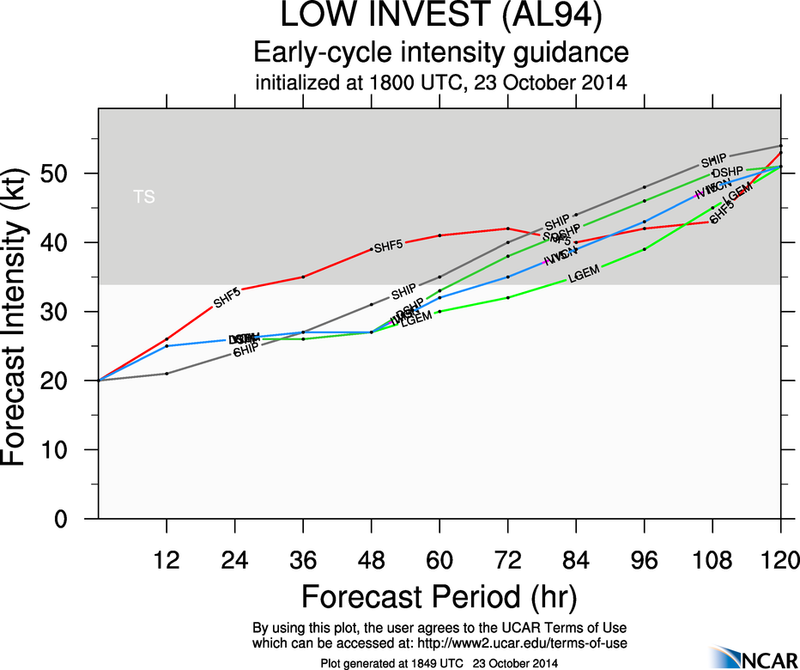 If 94L regenerates, will it be TD10 or back to 9? Here's a table with the solar eclipse in local times. Supposed to start in a few minutes here in S.W. Florida. I'm such an idiot. I told my friend not to stare directly at the eclipse because it can cause permanent eye damage, and then I went outside to let my dog in and stared at the sun myself. Good job, Cody. Wild turkey are really common in Florida. I clicked on the link and averted my eyes in case lol. Hey at least you put the myth to the test, and you can see what you're typing (unless you don't stare at your fingers like me). I see them all over the golf courses in Northern Pinellas county. The Eagles usually has the most. I might see 20-30 while Im out there. They got a whole month before they got to worry about anything. Back before the telescope and special glass filters were invented, this is how we would view an eclipse. The simplest safe way to view a partial solar eclipse is to watch the Sun's image projected onto a piece of paper. Poke a small hole in an index card with a pencil point, face it toward the Sun, and hold a second card three or four feet behind it in its shadow. The hole will project a small image of the Sun's disk onto the lower card. This image will go through all the phases of the eclipse, just as the real Sun does. Experiment with different size holes. A large hole makes the image bright but fuzzy; a small hole makes it dim but sharp. Today's partial solar eclipse is practically a non-event in South Florida. But I'm already making plans for the 2017 and 2024 total eclipses (and may even be around when the 2045 event covers much if Florida). It appears the 94L is going to move into the Caribbean tomorrow morning and it still has a pretty vigorous circulation. This could ramp up pretty nice over the next few days something to watch for sure. infact the last run of the HWRF early this morning on EX TD 09 showed a hurricane at 5 days due east of Cozumel. Here is the latest GFS. Strongest with this feature in over 36hrs now. Hey, KOTG.... u caught me on the evening drive .... lol ... but those clouds haven't brought rain to NP since about 1 p. m. I expect things will pick up again rainwise in the morning, though looking at that trajectory the central and SE Bahamas may get more than I expected. I commented this morning I think this will come back even with the dry air ..If not, crow does not bother me. 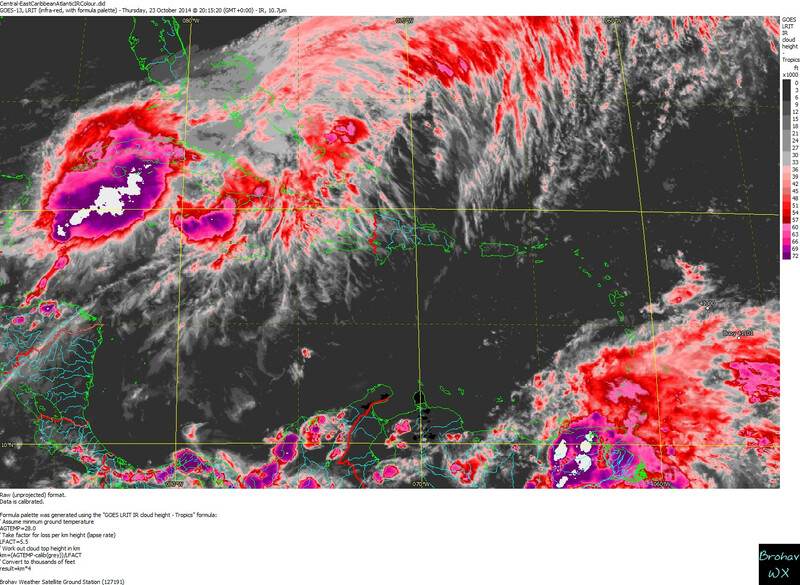 It will be interesting to see if we start seeing thunderstorms erupting just east of Belize tonight and if that happens it could tuck 94L right under those thunderstorms if they form as 94L does appear to be entering the westernside of Belize. I think Nea is good for 2017 & 2024 but 2045 maybe pushing it. My sisters and I did the small hole application back in the 60's. It worked very well! I'm already making plans for the 2017 event, will probably go to Charleston, SC for that one. Me too, but I eat right...God willing, I,ll make 79 with ease. This thing is STILL ALIVE! My god, it just refuses to die. Run for the hills. I will never say anything bad about the GFS model runs again. Out of no where the all the models dropped TD 09 yesterday. I must admit I have never seen that happen before with all the models maybe one or 2 yes but not all. Question WKC, why won't this get absorbed into the cold front? I know that lol (that could be a sign that something may happen because it happened on the same day as the power outage...I mean future reference...what models are showing anything forming and do u think something could form...Florida Landfall? It looks like it has a lot of energy with it. If this were October, I would be worried. 18 GFS puts 94 right back in the BOC. Are we to trust this run? Looks a bit like September. According to this, conditions should be favorable. The GFS especially has been an embarrasment to US forecasting models all year. Even the simulated Fim7, the fimmiest of FIM's, is having a tough time even getting this thing to blow out a candle. Just talked with my nephew on San Pedro , Ambergris Caye , Belize , he says they are having some real nasty weather there! Remember when the HWRF had Cristobal coming ashore Miami as a Cat 4? Or was that the GFDL? Are we really going to go through all of this /again/ after the fiasco of wishcasting a Cat 2 into Tampa the other night? There is 60 Knots of wind from the west in the GOM and it looks to be increasing over the next few days. That's not a positive look for any storm coming into it. Same to you my friend, year after year. A toast across the waters to you and yours. TD-9 Its Alive! Its Alive! My prediction still stands true that it will get north of Cuba, and we will better know the track by Thursday at the latest. The small birds were flying towards Miami this morning. Maybe they were confused by an unknown deep lava shift, or maybe they were just catching the morning heat lift to ease their tiny wings on their flight to seed town. Another possibility is they sense a shift in atmospheric pressures because they fly up and down really fast and communicate amongst themselves often in the first light. 94L/exTD9 wants to make a name for itself! Could NHC make a Updated Advisory before 2AM EDT (Usual Update)...We Will See?. What do you guys think? How about "The Comeback Kid"
Tropical Storm Ana is now forecast to merge into the westerlies and head toward the West Coast. This chart shows the situation on Saturday when a strong low will approach the Oregon-California border bringing wind and rain. Ana will be absorbed into the next low upstream, a warm occlusion system, and head toward the British Columbia coast with an expanding wind field and of course, plenty of moisture. Hoping some of that reaches California. It has a yellow X again. It could drop south and become an EPAC storm. DestinJeff here. How have you been? I've been away, officially, for some time now, and I trust I will be again in short order. I wanted to say so long to everyone, who for the past several years (including those I have spent in Witness Protection) have filled many of my days with knowledge about the tropics I would have otherwise never gained. This was my last season on the Emerald Coast, as I am soon moving out of state sonewhere a lot more like Colorado (mostly because it is). I don't imagine I will be on much. I'm sure this handle will be added to the heap and I won't be able to use it any longer. A bunch of us pissed a lot of people off. The year was 2010... I remember it like it was four years ago. Drums were involved. I don't know... We all said things we regret, except all that funny stuff I said. I don't regret that. There are no hard feelings. We are all characters here, and we all play a role in making the community whole (even those of us that reside now at that place WU won't let me say, but it starts with a "w" and ends with a "eatherbunker". We are all there, living a nice existence. Anyway... This isn't about that. It is about the season being over, and me taking the chance to say thank you. It has been real fun. Also, how in the hell did "notcircumventing" last as long as he did? I mean, the name? And his avatar was that of freaking Grandpa Simpson winking. He was a good man, as was that USAFWXGUY. And RMadillo. And many others. Keep, thanks for not outing me. Aww man, take care Destin. Wow, good to see you ...I was pretty new back when I saw you on. I did however enjoy your posts. On more than one occasions you made me laugh. Plus the damage wasn't bad at all. Don't forget that just 2 years ago Sandy caused 60-70 billion in damage. That's 60,000 million. after that time while the low drifts generally northward. 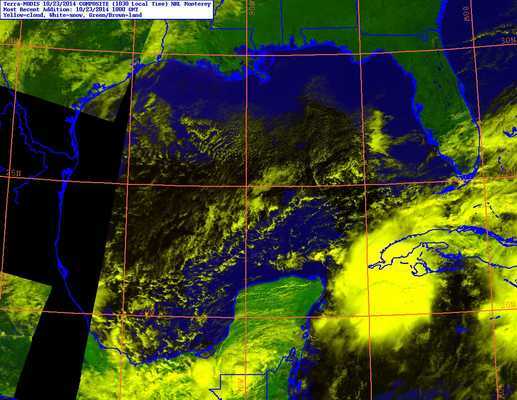 Wow look at all that blue east of the Yucatan. And look at the buzzsaw north of it. Took me a while to realize it but this place really did need a blog that could poke fun at everyone/anything WU. I wish that blog was still here. Winter Snow Storms could open up a whole new world for an FBMinCo. See ya 'round like a donut! I'll have some mustard on that pretzel ... lol. That was mostly for people thinking it would survive a trip north. who is to say those conditions will be around when it finally moves north? It doesn't look like a northward movement anytime soon (maybe at a later point). Models want to take it into the Western Caribbean and as the high builds in it will move back westward or maybe even southward - see post #344. I went through Levi's model page and found nothing promising. Hoping this takes the EPAC route, don't want this in the NW Caribbean! Yah, you can see a decidedly south/southwest movement. Are we supposed to care about any of this? This doesn't look organized, but who knows after it emerges..
Yea, until it hits the water we won't know much. Clearly the interaction with land has helped it generate some nice storms. Let's see what happens tomorrow. IMO it has an intact LLC with strong convection, that's why I want it to take the EPAC route, don't like October storms in this area, they hang around like a bad dose of herpes! I'm excited for the April 2024 eclipse. 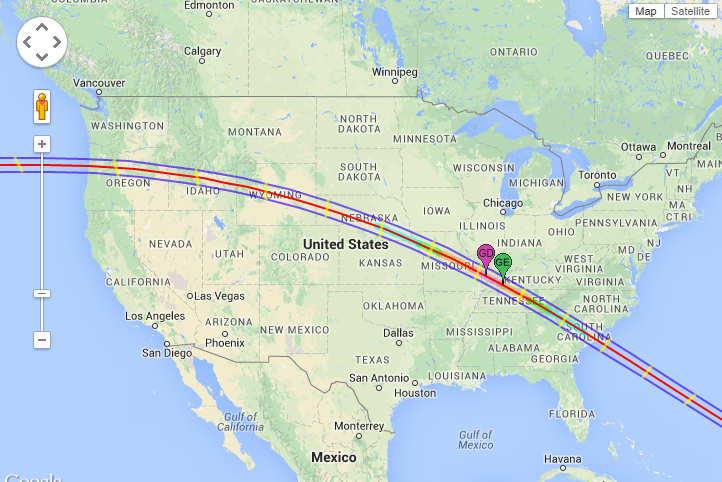 It will be near totality at my house (Metro Detroit) with totality being only an hour or two drive S or SE. Already thinking about where I would want to go for the 2024 event. I think I'll give our latest invest until Saturday before I write it off. I don't need some cat 14 blasting the east coast. Just give me one more name.... a gentle low-range TS that moves over Cuba and out to sea with minimum fuss.... is that too much to ask???? I don't know if I'm taking it that seriously so far. However, I am well aware that TCHP in that area have been untapped this season, so if atmospheric conditions allow, whatever happens there could be explosive in nature. On this side of Cuba, I still have a little breathing room. YMMV. Meanwhile, it looks like it's going to start raining again here before midnight. Anybody feel energetic enough to post a few Cuban radars? This is a few days old, but the TCHP is off the scale S of West Cuba. One more thing...sorry lolol (Look at the Legend of what everything means and tell me what you see in the Caribbean!? That's what I admire about you Donnie, you have always marched to the beat of a different drummer. The Yucatan is soggy. The next weak front will pick up what is left. You can call it 22 E st, 90 whatever, or the next name, but it is still the same malfeasance as before. It's name is DOOM for the non-believers. NEAR 18.5N 86.5W AT 25/1730Z. I say LBAR! *Takes it over my house. Seems logical enough. Modellers from AIR Worldwide estimate that Gonzalo inflicted $200-$400 million (2014 USD) in damage in Bermuda when it made landfall as an upper-end Category 2 hurricane last weekend, comparable to Fabian's damage total of $300 million back in 2003. Depending on the exact total, Gonzalo may go down as the costliest hurricane on record to strike Bermuda. 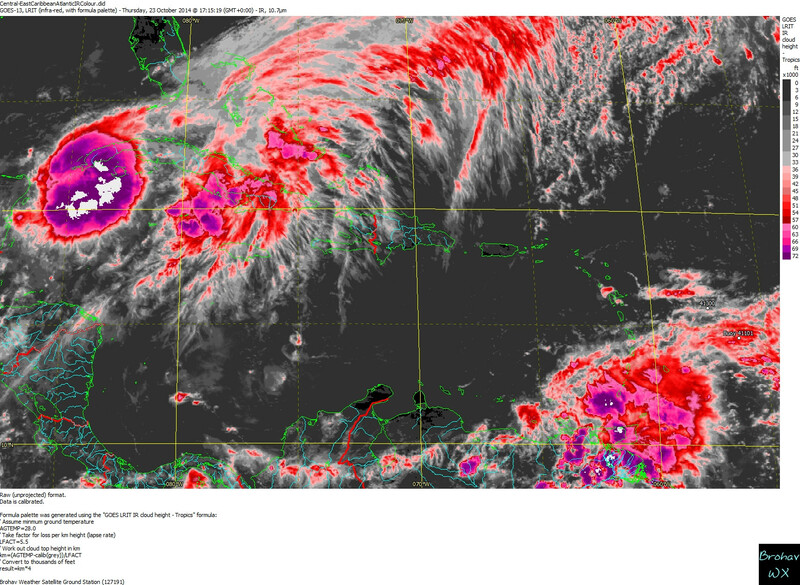 The storm is responsible for 4 deaths--1 in St. Martin and 3 in Britain from Gonzalo's extratropical remnants. I just came in off a boat run to Kaibo, dead quiet in North Sound. Quite surprised to see this increased blow up off Belize / Bay Islands tomorrow? thats a good bit of damage, considering the island only has 65k inhabitants. Here is an animation & reconstruction data for precipitation since 1900. It's in a really large quicktime movie format..
Levi 32 and Drakoen also mentioned this possibilty during the last couple of days. 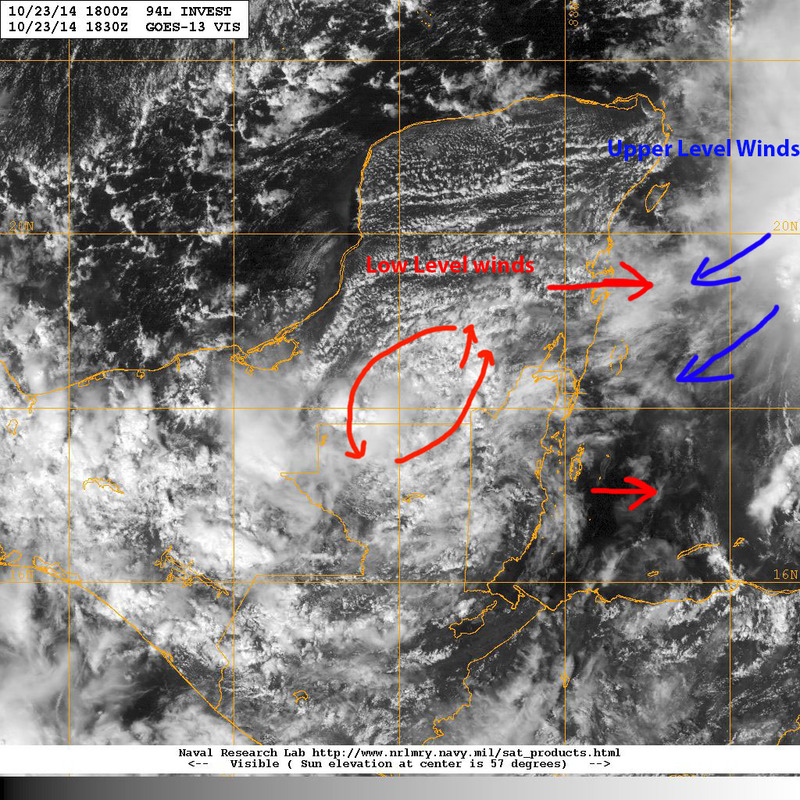 Drak' says; 'Double barrel low pressure " potential when I-92 emerges off Yucatan. Take a look at current sfc chart. Hmm..Increasing convection over land during the night. Usually this would occur during the daytime, no? Anything is possible but your caps lock key is apparently stuck. I wouldn't write off a trip to the Pacific just yet either. Not in the tropics, especially Belize and the Yucatan. I've seen some some pretty big nighttime storms when I've been down there. Convection can flare up almost anytime. I'd put the odds of 09L ultimately regenerating at 30%, and even that might be too generous. Far greater chance it doesn't. What I notice over the ATL is that positive anomalies have moved north over time. Might help to explain why tropical cyclone activity has become generally more concentrated in the subtropics over the last ten years. Nice. Will look for that in the morning - out for now .... nite! My area of Central FL was soggy last month, but is drying out now and could use some rain. I guess the irrigation systems are my only hope to keep my new yard lush in the near future. I am honestly disappointed that yet another system looks like it will under-perform and defy many's expectations. What expectations? No credible person actually thought this would be the next hurricane for Florida. Having said that, I kind of think the shear will be less than what the GFS is forecasting. If you look at the water vapor imagery over the United States, it doesn't favor an amplified trough digging below 20N. 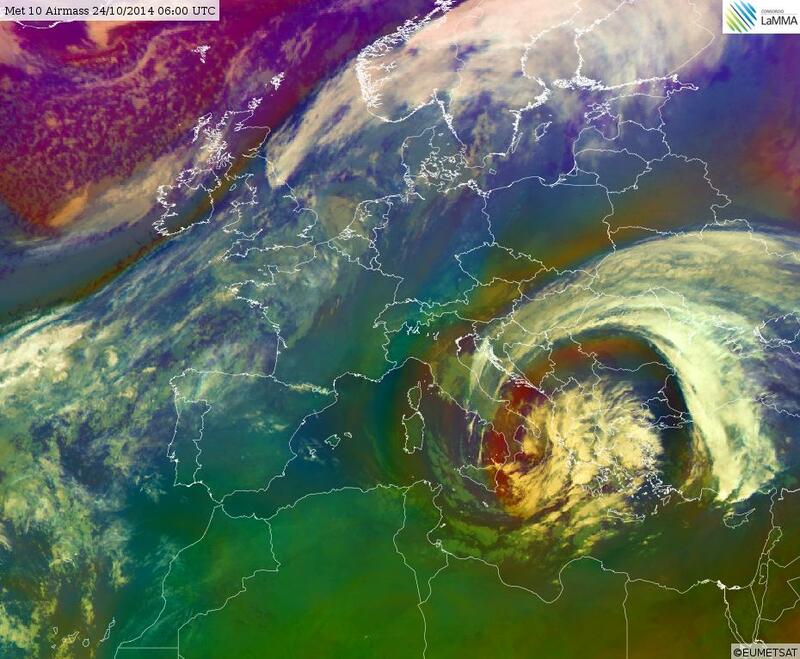 If the system can survive the next three or so days, it will need to be monitored carefully. Greece is looking forward to some heavy precipitation within the next 24-30 hours as the decaying remnant of ex-hurricane Gonzalo passes through the region. Some areas are looking at over 100 mm of rainfall. Higher areas may expect snow, up to 30 cm. GFS, accumulated rainfall until Saturday morning. cold front in two or three days. good morning got to be racking up large amounts of rainfall s.cuba its mid 60s and cool here e cen fl. Pretty noticeable end to the rainy season here in Fort Myers. Only 37.72" of rain for the year. We should be at 51.68"
I wouldn't be suprised if some areas of Cuba received well over 10" this week. They had heavy rain almost every day in parts of central Cuba. Looking at the sat loop, it's going NE. while the system drifts eastward. cuba had an event i believe back in the 1920 or 30s up to 100 inches. stalled out low level trough are dangerous too. so this is not a first time not even close. Good morning. Off topic but just thought I'd point it out- for the first time, the SPC is utilizing their "marginal" severe risk category for tomorrow in parts of the Northwest with the big Pacific storm moving in there. No more "See Text". Anybody in the Northern Bahamas on here get ready as you guys are in for some Gale Force conditions today & tonight with heavy driving rains. Belize currently has a pressure of 1009mb. Oh by the way the SOI is crashing right now big time so it does appear that El-Nino will be declared in December finally! Going to be a slow up hill climb though to what could be moderate El-Nino next summer and if that occurs then I sure hope everyone enjoyed this hurricane season as next year looks to be a very slow one. Interested to see the visible images this morning on 94L as it does appear to have its circulation intact and is now back over the water. GFS drops the pressure to 1002mb with the system when the system gets east of the Bahamas. I wonder if the NHC upgrades it to a subtropical depression if it reaches that pressure? NHC never makes any mention of it. Either way doesn't matter as Nassau is for some very squally weather today and oddly enough I just got back from there on Monday. It was 61 when I left for work over in Sweetwater. Very nice weather but gets hot during the day. The last october that i remember it being this warm during October was 2009 which led to a cold wet Winter & Spring so we'll see if we repeat that in 2014/2015. With El-Nino becoming more and more present i believe we are in for a real treat this Winter and upcoming Spring. Heavy rain forecast for Nassau. Thunderstorms with locally heavy downpours. High 81F. Winds SSE at 10 to 20 mph. Chance of rain 100%. 2 to 3 inches of rain expected. I hope we get another ice storm in NW Florida! I grew up in SE Minnesota and there is nothing funnier than trying to watch southerners drive on icy roads! As a bonus we got 2 days off from work because of the ice! 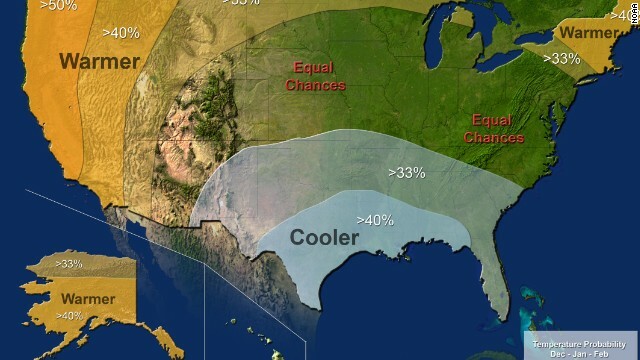 CNN) -- Oh good, the brutal cold conditions that froze much of the country last winter are unlikely to happen again. The National Oceanic and Atmospheric Administration said in its seasonal outlook Thursday that some of those areas east of the Rockies might even see warmer temperatures this time. Remember how we kept talking about the Polar Vortex last winter? Chances are there won't be as much chatter about it as we move into December and January. "The Polar Vortex is always there," CNN meteorologist Dave Hennen reminded us. "When it breaks, it spills cold air into the U.S. It's pretty unlikely that it would happen two years in a row." Looks like NOAA agrees, though it warns folks in the South and Southeast to expect below-average temperatures -- and more precipitation. So cities like Detroit and Chicago that saw record amounts -- or near records -- of snow shouldn't have as much of the white stuff, but Atlanta and Dallas may have to keep their snow plows ready, Hennen said. While we probably won't hear as much about the Polar Vortex, we might see El Niño move his way back into the weather discussion. Hennen said forecasters have been waiting for an El Niño to form in the Pacific, but it has yet to materialize. NOAA's Climate Prediction Center puts it as a 67% likelihood of happening during the winter. But the El Niño will be a weak one and bring only some rain to drought-stricken California and other states in the West. "We're likely to see normal amounts of rain," Hennen said, "which will help with the drought, but not alleviate it." Northeast --- above-average temperatures, above-average precipitation along the coast. Hennen said it's important to remember that a lot of storm systems start in the South and work their way up the coast, so cities like New York and Boston might get more than their normal amounts of snow. 94 is moving tight. Probably not a good idea to rent a Hobie Cat in Key West this weekend. Boom ! there she goes. freak weather is due to global warming or is it due to internet access its always been that way. combination of both make it even scarier. Shouldn't the NHC give 94L a chance, why are they saying development is UNLIKLEY? Tropical Depression #9 was originally Invest 93L. It moved ashore in the Yucatan. Now that it is again being watched by the NHC, and became "another area of interest," it was renamed 94L. ?? This is still the same original system ... the remnants of T.D. #9???? Why is it not 93L again, or do they consider this a new area of interest, combined with the non-tropical low pressure system to its east? Amen, Sf5; I've been in SoFla the last five years -- living in Cape Coral -- and this was one of the driest summers ever for me. I watched an awful lot of rain skip the south Cape for other parts, and August was a complete bust here. I sure was hoping something weak and wet would wander out of the Gulf or NW Caribbean and load us up good before winter locks the doors. Just saying 2004 Hurricane Season was active DURING an El Nino. Rain last 24 hours 0.44"
We are about 10" below normal for the year to date and we were hoping for some more significant rain. Maybe latter. Re: #454 (and others) - as narrow as SoFla peninsula is, it's astonishing how different the weather can be from one coast to the other. Almost none of the rain that has plagued the east coast has visited us just 90 miles over on the west coast, and I'm sure the view from the beach balconies in FtLaud and Miami this a.m. couldn't be more different from the dry, brilliant blues I'm looking at right now in the Cape. However, 2004 was not a traditional El Nino, it was a Modoki El Nino. The latter are well correlated to active seasons. Weather here in Roatan Honduras is now overcast with a westerly wind slowly picking up. While we're at it: I can't help but wonder about the mid- and upper-level dryness that has limited or snuffed so many tropical systems these last few years. Big events: the drought in the Amazon, the heavy dominance of SAL over the Atlantic, the inability of El Nino to fully switch on ... all make me wonder if we've deforested enough of the Americas to start a "feedback loop" that makes the cycle of Western dryness easier and easier to perpetuate. Though I'm sure some folks will say that the entire cause is the Pacific's current cold PDO cycle, I have personally experienced (on a regional level) the atmospheric-drying effects of severe deforestation and expect there has to come a point where enough of it has happened to make some sort of difference in weather/climate over a broad region. I was going to comment on this earlier. Miami has a 90% chance of rain today; Naples is at 0%. And while some very heavy rains have affected parts of South Florida this past week--Miami, Palm Beach, the Keys, and so on--Naples hasn't seen an official drop of precipitation since the 15th. We're at 1.43" for the month, which is well below the to-date avarage of 3.5" Having said all that, however, we're still above normal for both the year and the period beginning June 1st thanks to a fairly wet summer. It wasn't, the El Nino that year had already ended. Some weak banding still remains with the remanent low. Thanks for posting ,good to hear from Roatan, one of my favorite places in the world! best case scenario is for 94 to get up and get out of there or worst case is it to stall and meander around the area for another week or two. kinda looks like that map is flipping us off. morning all looks like models want to curve this one to south fl today ? wind here in North East Dade. It'll go from a slight breeze for 5 minutes to 30 mph gusts. The rain looks like it'll show up in a couple hours at most. It was just beginning, El Nino was declared during June, July, August period. Rain Last 24 Hours: 0.44"
Storm Total Rain (10/22): 1.76"
true indeed..It looked Modokiish to me tho...Sept of 2004.. It could get really cold by Halloween for many in the East!!! The GFS was showing a significant cold blast for the SE United States a few days ago in the long run and has since dropped that. However the 00z ECMWF is starting to show a rather decent shot of cool air coming down into the eastern part of the country by Halloween, so we'll see! A weak El Nino will probably develop by the year-end, according to MDA Weather Services. While sea-surface temperatures are warmer than normal across most areas in the tropical Pacific ocean, it still doesn’t qualify as an El Nino, Kyle Tapley, senior agricultural meteorologist at MDA in Gaithersburg, Maryland said in response to e-mailed questions Oct. 20. Some additional warming could lead to the development of a weak El Nino, he said. The Australian Bureau of Meteorology maintained its El Nino watch status this week, indicating at least a 50 percent chance of a late-season event. El Ninos can move agricultural markets as farmers contend with drought in Asia or too much rain in South America. Palm oil, cocoa, coffee and sugar are among crops most at risk, according to Goldman Sachs Group Inc.
Two of eight models are just shy of thresholds for an El Nino, while another three models show thresholds will be reached by January, the Melbourne-based Bureau of Meteorology said Oct. 21. While a weak El Nino is possible, the chances of a moderate-to-strong one is “very low”, said David Streit, co-founder of Bethesda, Maryland-based Commodity Weather Group LLC. ATLC WATERS SAT AND SUN...THEN MOVE INTO THE E CARIBBEAN MON. i say we get two more, if not , crow broiled might not be too tough. 94L has now made it offshore Belize and continues eastward. Yesterday morning I mentioned that 94L could be overtaken by the front as it sags to the South and become absorbed on the tail end, only to produce a new low thereafter. I still consider this a distinct possibility depending on the timing of the forward motion and trajectory of 94L, the speed at which the front moves to the SE through the NW Caribbean and where it eventually stalls. 94L is likely to continue to the East or just South of due East today so this scenario will need to play out over the next 24 hours before the situation will become clearer. Actually it's a good call. There's nothing there right now. Maybe there will be in a few days time, in which case they can start issuing advisories. This is not even a blob right now.